A small Cathedral rests quietly on the outskirts of Moscow. Multiple arches compile the cathedral's roof and a steeple rises in the center. Tall,leafy trees stand near the cathedral. Light clouds float above the treetops. A lovely, calm scene. 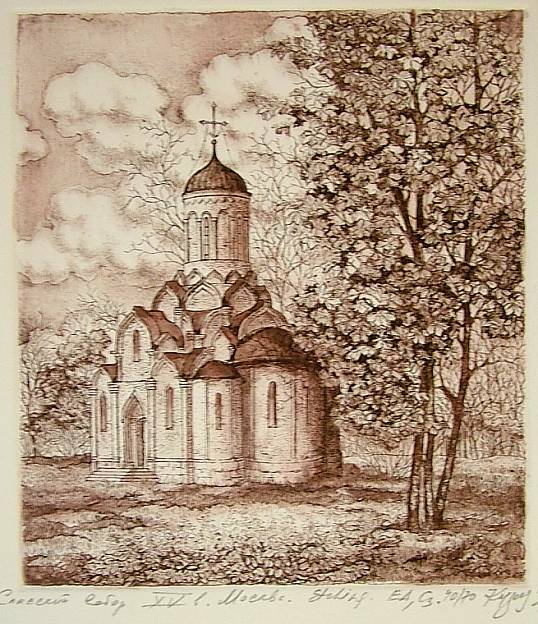 The title, artist's name (Margarita V. Kuzminskaya), number (40 of 70), and year (1998) are including on the etching.